The area of the base (small disc) is B = Pi r2. 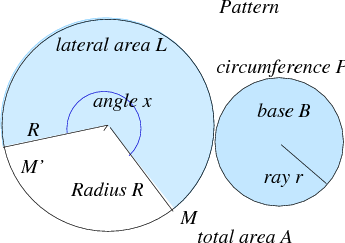 The measure in radians of the arc AA' and of the angle is 2πx /360 . 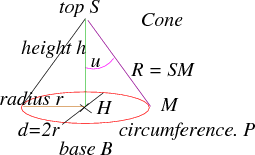 The height of the cone is h = SH. The volume of the cone is V = B h/3. 2) a sector of a big disc (lateral surface).